Food?! The idea makes me anxious right now. Finishing up chametz [= containing leavened wheat products, mostly, plus general fridge leftovers of the kitniyot variety] food, buying kosher for Pesach food, hoping that the six handmade 100% whole wheat shmura matzot that I'm bringing from NY to CA won't break during the flight (or before or after it). Who wants to place bets? I just need three of them to make it across the country unbroken. Before that, though, I need to bring them across town on a bus and a subway. It's not clear which is more dangerous for fragile matzot. Donations can also be made on-line to Yad Chessed, an organization that runs a Ma'ot Chittim program and provides food and other assistance to needy families. The West Side Campaign Against Hunger has a food pantry and accepts donations of unopened food. The address of the pantry is 263 West 86th Street (in the basement of St. Paul's/St. Andrew's church; enter at 86th and West End using a ramp). Open Monday nights, closed Tuesday, and closed every day from 12-1. For other hours and more information, call (212) 362-3662. Donations of opened and unopened food can also be made to the shelter at the Broadway Presbyterian Church at 114th and Broadway. Call (212) 864-6100 for more information, as well as to arrange evening drop-offs. Note that the Broadway Presbyterian Church's Broadway Community Incorporated program also accepts toiletries. One year, before Pesach, I finally gave them all of those mini toothbrushes and tubes of toothpaste from international flights that I never use. (Because I travel with my own, not because I don't brush my teeth. Just in case that wasn't clear.) They were very grateful. I also have this ridiculous habit of collecting shampoo and conditioner from hotels, even though I don't really end up using most of it. Or if I use it, I don't use all of it, so I have many half-used mini bottles of shampoo and stuff lying around. I shall try to gather it together and bring it to Broadway Presbyterian this week, along with any chametz that's still lingering. There! Whew! Food-related stress now greatly reduced! And now, without further ado, some interesting posts from other folks, while I sit here handling (or not-handling) typical pre-Pesach anxiety. It's really more about the anxiety than the actual tasks at hand, which really aren't that onerous. Thegameiam writes about the sale-of-chametz forms he's seen around and his problem with them. Well said. Here is Jacob Richman's ginormous list of Pesach links, including sites in English, Hebrew, Spanish, Portuguese, French, German, and Italian. Check it out! "Passover Through Archeology and Rare Documents: A Teaching Site" is a new website put out by the good folks at the JTS library and the Center for Online Judaic Studies based on the conceptual work of George Blumenthal. Very cool! Here is the press release about it. The Open-Source Haggadah. A cool idea. I haven't played around with it enough yet to know how well it works or what kind of sources are available on it. Absolut Haggadah [PDF]. I know nothing about it. Maybe you'll find it interesting. Josh Waxman, about whom I also know nothing, introduced it and gave a short review here. I liked what he said, though, so I downloaded it. I haven't had a chance to look at it in depth yet, though. Who has time? Pesach is coming! The Velveteen Rabbi's Haggadah for Pesach, v. 5.0 [PDF], by Rachel Barenblat. Ditto. Looks really cool. Downloaded it. Haven't had time to read it. 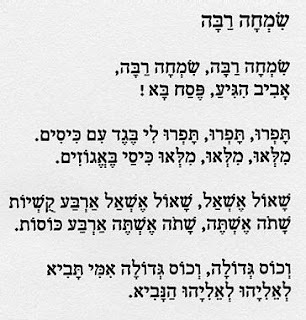 The weather outside this morning reminded me of this Israeli song, which was part of my regular pre-Pesach repertoire as a child. Aviv higiyah, indeed! Although I did see one remaining pile of snow this morning, I've also seen lots of crocuses and it hit 70 degrees (F) here today. Yesterday, Central Park was full of a gaggle, a flock, a veritable fleet of robins digging up worms and gulping them down. Did any of you grow up reading The First Robin of Spring? I could have sworn we had a book with that title as kids, but I couldn't find it on Amazon. Anyway, it was nice to see the birds feasting. I couldn't believe how many there were.